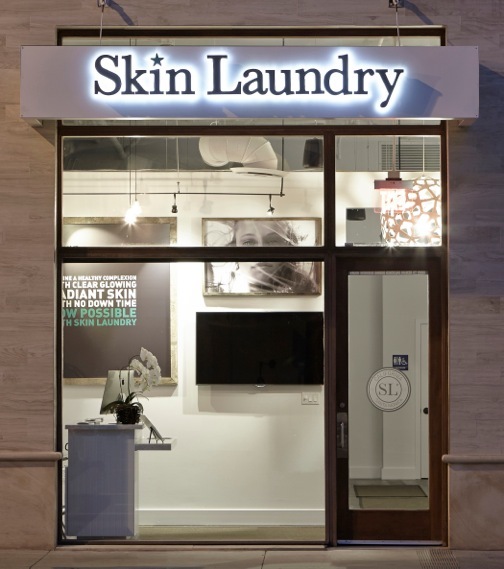 Skin Laundry’s two locations in Los Angeles are bright, airy, and extremely clean. I went to the Santa Monica location and met with Dr. Elson Lai, who patiently explained the 2-step facial process. The first part uses advanced cosmetic lasers to kill bacteria and clean the skin. The second part uses intense pulsed light (IPL) to stimulate collagen and even out skin tone. The facial is suitable for all skin types, even acne-prone and sensitive. When I got there, I signed in on an iPad and was given a wipe to take off my makeup. Licensed registered nurses perform all the procedures. After lying down, goggles were placed over my eyes, and the laser was drawn once across my forehead, left cheek, right cheek and chin. I’m a complete baby when it comes to pain, so I personally reckoned the feeling to tiny prickling needles, but the painful part only lasted a quick 2 minutes. A cool gel was applied to my face (ahhh!) and I didn’t feel the IPL portion at all, though I did "see" a red light through my closed eyes. The whole thing was done in less than 10 minutes! Immediately after, my face was noticeably brighter and tighter, and my pores were minimized. My glowing skin had no redness or irritation that is associated with facials with extractions, even though my skin felt and looked liked it had been thoroughly cleaned. I went about about my day without skipping a beat. Skin Laundry is currently offering first time clients a free facial. Single treatment, packages, and monthly memberships start at $75. For more information and to book an appointment, visit skinlaundry.com.